Toric high-end contact lenses for up to 30 days continuous wear. PureVision Toric is one of the first toric contact lenses which, with the agreement of your eye doctor or optician, can be worn without break the whole month long - day and night! PureVision Toric unites the proven technologies of the PureVision Spheric with the patented Lo-Torque Design of the SofLens Toric lens. 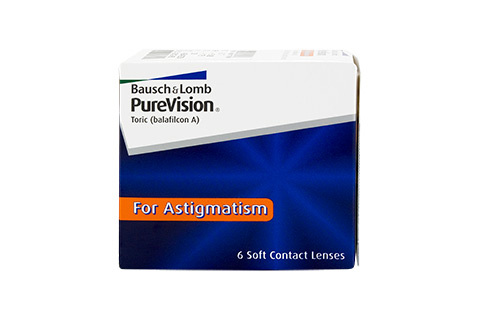 PureVision Toric lenses offer sharp and clear vision for people with astigmatism. The unique silicon-hydrogel material enable an excellent oxygen permeability and ensure that the lens always sits perfectly on the eye. At the same time the low water content (36) prevents any dryness of the eyes in long periods of use or in air-conditioned environments. With the ability to wear PureVision Toric continuously, care for the product is reduced to a minimum - liberating the wearer. A spontaneous getaway or overnight trip is no longer a problem with PureVision Toric. Whether short-sighted, -far-sighted or astigmatic, in light and dark conditions, PureVision Toric equips you with sharpness and clarity of vision. Take a look at our bundle offers when you order PureVision Toric and cleaning products in the Mister Spex online store. Mister Spex advises all online purchasers of PureVision Toric contact lenses: the contact lenses, PureVision Toric, should always be fitted to your eyes by an eye doctor or optician. The period between fittings, unless otherwise prescribed by an eye doctor or optician, should not exceed 6 months. You should go for regular check-ups. The manufacturer Bausch & Lomb/your eye doctor/optician's recommended wearing time for PureVision Toric contact lenses should be followed strictly. It is your own personal responsibility to make yourself aware of the care instructions for PureVision Toric contact lenses and to follow them accordingly. In case of eye irritation or visual impairments caused by PureVision Toric, remove the contact lenses immediately and consult an eye doctor or optician. Damaged contact lenses should be replaced immediately.